No sooner had the Olympic torch been run out of town than in rushed the cavalcade of opera singers, musicians, actors, dancers and literary talkers for the start of the 34th Buxton Festival. Leading them, so to speak, was Stephen Barlow, the new Artistic Director. Nothing daunted, he decided to take up the baton for the opening night. The tradition here is to surprise us with works from opera’s old curiosity shop. Even if we’ve heard of them, we may well not have seen them, sometimes prompting the ironical “I wonder why?” Not the case with Intermezzo, but we have the double bill of Sibelius’s The Maiden in the Tower and Rimsky-Korsakov’s Kashchei the Immortal lying in wait. 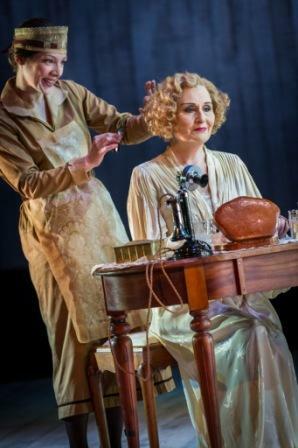 Starting with Intermezzo, Strauss’s autobiographical comedy-with-feeling, neglected for years after its Dresden premiere in 1924 and still not favoured with a London production, has a novelty value certainly. Delightful, tuneful and (melo)dramatic in its re-telling of the temporary domestic dissonance between man and wife, Richard and Pauline, and their happy reconciliation, it got proceedings off to a thoroughly enjoyable start. It was also a finely judged choice for this small glittering Edwardian opera house in the Derbyshire hills, embracing the intimacy of the piece. Set in Austria in 1902, in the mountain resort of Grundlsee and in Vienna, we see the story played out cinematically in 13 scenes linked by symphonic interludes. After each scene the curtain comes down, like a screen image fading to black, and the wonderfully descriptive mood music comes into its own. The domestic situation is temporarily disrupted by Robert Storch (Strauss) going off on a two-month conducting assignment, leaving his sharp-tongued wife Christine (Pauline) to her own devices. She soon meets a young admirer, Baron Lummer, on the slopes and develops a dalliance. All goes well until she opens a letter from a femme fatale to her husband, implying that he’s misbehaving while on tour. The impetuous Christine starts divorce proceedings at once, but is soon assured that the letter was intended for Robert’s colleague Stroh (easily confused with Storch?). The upset is sorted out and the couple resume their marital bliss (rather than blitz). It would be a trivial, if touching, tale, were it not a representation of a significant episode in the Strauss household. It’s really a love story in the end – and Christine, for all her bitchiness and self-pity, is really a pussycat. Conducting the Northern Chamber Orchestra, Barlow revelled in the interludes, drawing out those tell-tale Strauss melodies, which reaffirm the storyline. The libretto, written by Strauss himself and sung in English with side titles, reflects the domestic nature of the conversations, delivered in recitative form. That’s what it is – a plain and simple conversation piece and you need to pay attention to the words, some sung, some spoken, to share the humour, the feelings and the irony. At the centre of it all is Christine, who is hardly off the stage. Janis Kelly is just terrific in the part – querulous, self-serving, bitchy, coquettish, loving. Hers is an all-embracing characterisation and she sings with great clarity. The show is worth seeing for her alone, although she leads a fine cast. Stephen Gadd is a patient husband and Andrew Kennedy makes a nicely duplicitous Lummer (though he looks a tad too mature to be a toy boy). 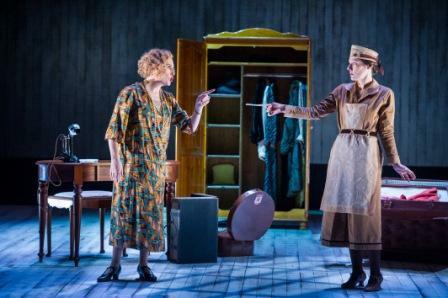 Susanne Holmes as Anna (pictured below, to the right, with Kelly), the no-nonsense maid who puts up with Christine’s sharp tongue, pleases the eye – and the ear. Director Stephen Unwin keeps the “play” workmanlike and practical, as befits the “ordinary” life portrayed. The staging is minimalist - essentially just a few sticks of furniture on a bare stage. At least this facilitates the swift scene changes, from domestic dining room to tobogganing to a Viennese ball and the rest. The downside is that this gets a little repetitive and there is no atmosphere. But, in the end, the atmosphere comes from the music, made to accompany a silent movie. Richard Strauss, the man and the composer, carries the day. This performance was dedicated to the memory of Malcolm Fraser, the young man who had the unlikely idea and imagination to start the Festival in 1979, who died earlier this year.